Unfortunately, I think this book is a bit of a wasted opportunity. 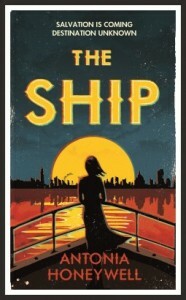 It has an interesting initial premise with one of Britain's last rich men trying to flee a dying world on the Ship of the title along with his teenage daughter (the book's protagonist Lalla) and 500 hand-picked others. All the passengers are grateful for their apparent salvation with the notable exception of Lalla who may be the primary reason for her father's plan but who would rather try to save the world than run from it. The book is entirely told from Lalla's perspective and I think that's one of the book's biggest problems because she has lived an extremely sheltered existence and is painfully naive at the beginning of the book and while she may learn more through the book it doesn't really feel like there's much actual character development and it's frustrating to have to wait a long time for Lalla to slowly realise things that were obvious to the reader from the start. For the book to work, I think we'd need to feel a bit more admiration or interest in Lalla but although it's possible to feel sympathetic for her it's also hard to really disagree with the other characters when they call her self-centred. The other characters in the book also feel shallow, and although the society aboard the ship has a definite dystopian undercurrent despite being superficially pleasant there's also not a huge amount of subtlety in the world-building. It's a fairly quick read and there are some well-written passages, so I think the book could have risen above its flaws if the plot had developed in a more interesting way but after the frenetic start there's not a huge amount of plot movement until the finale and sadly the end didn't really feel believable.